By all rights we should be getting well and truly tired of sups. In fact, I have a good friend who swears off the stuff after St Patrick’s Day, opting for salads and wraps even if the mercury is mired in single digits and sleety rain. But I’m not quite ready to abandon my comfort blanket of warmed and blended vegetables, pulses and herbs just yet. How about you? I was almost tempted to the salad side today though. It was a cracking 12C (!) up here in Edinburgh, which, if you are unfamiliar with a British winter, is extremely warm. Relatively warm enough to make rash decisions like picnic on the beach (I overheard a young man say that’s where he was headed), or forget your coat. And as I walked a cobbled lane on my way to the splendid Stockbridge Market to pick up my weekly supply of kale, root vegetables, and, um, a black pudding Scotch egg (hey, it was 50 pence off due to it being squashed), I passed more than a few people pottering in their gardens. One brave old chap was enjoying his suntrap position, sunk in a low-slung chair, mug of tea in one hand, tabloid Sunday paper in the other. His eyes were closed as he gave in to the low brightness of our best day of the year. It’s been a stunner, if not quite a scorcher. And really, not quite warm enough for salads. At least summery, lettucey, pretty salads. I’ve got a few early spring salads lined up for posting soon, so don’t think I am a complete hypocrite when you see them – they won’t be lettucey or particularly pretty, I promise ;D But soup is still king for my lunch, and probably yours, too. This one is the product of another of my night-time random musings on food and food combinations. I know that broccoli is alleged to originate from Italy, where the first calabrese was grown over 2000 years ago. So, sometime around 3 am one recent morning I wondered if perhaps one of the Ancients might have eaten calabrese with basil in a zuppa of some sort. Then I remembered a huge bag of cashews that I have been using for sweet recipes and dips and thought they might be good too, although not very Roman. And then I remembered some wonton skins threatening to frost over in the freezer so decided that I would use them as a kind of fusion crouton. Well, I think it works. You can be the judge. Sometimes my nocturnal ponderings on food are more abstractions than actual recipes but, even in the cold light of day and several nights of unbroken sleep later, it still seemed a good idea. 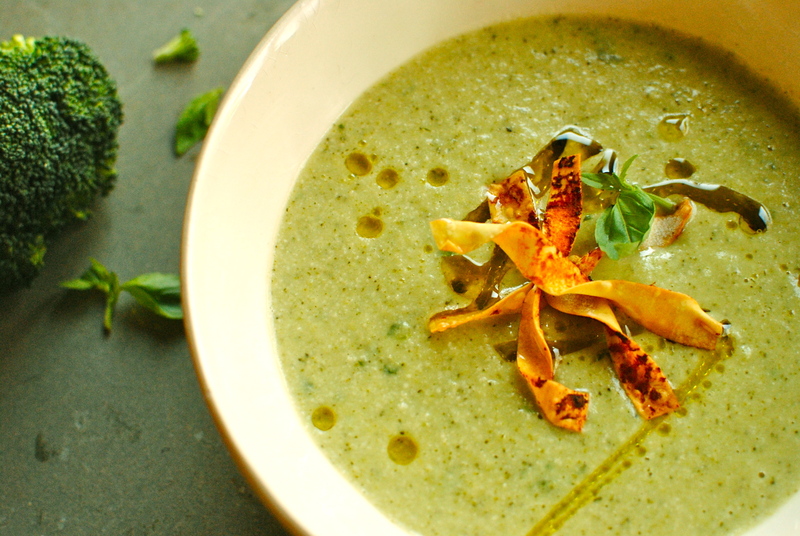 And speaking of good ideas, nuts in soups are not as bonkers as they sound. Vegans are familiar with them, or at least the milk form, as they do a good sub for cream, adding thick richness. 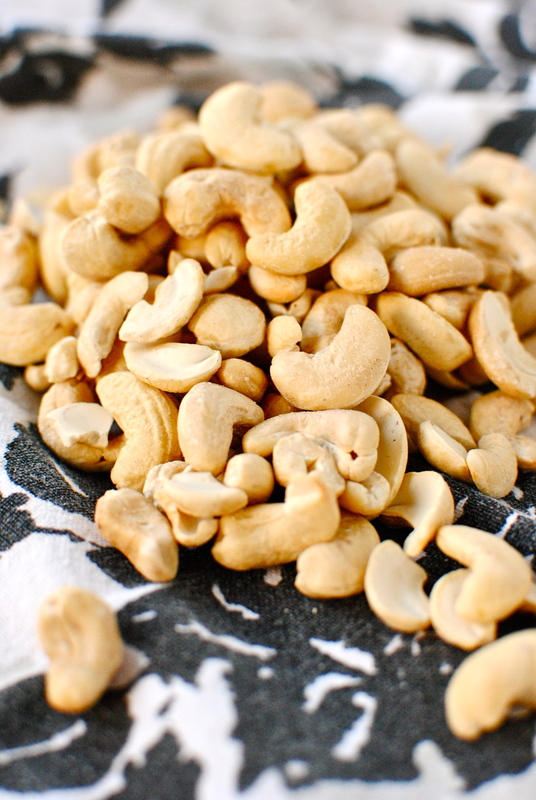 And raw cashews are a surprisingly good choice – creamy, pale and mild. Nutritious too, what with all the magnesium, phosphorus, copper, zinc and iron. Vitamin K and thiamin too. Sure they are somewhat high in fat, but it’s mainly the good, monounsaturated, artery-excavating kind, and they make for a very filling soup. I like to soak any nuts I might blend – whether it’s for soups or dips. It really makes a difference to the end result – creamy and smooth rather than distractingly nubbly, like tasty sand. Oh gosh now that’s got me thinking of Noma, Rene Redzepi and Heston Blumenthal, and it’s not even 3 in the morning. Onto the soup before I start daydreaming about edible soil salads, and other flights of molecular gastronomy fantasy. But don’t worry, I will keep those dreams to myself. Do you dream in recipes? Do you make them? What’s been your biggest dream-to-plate success so far? Miss R’s Track of the Week: Aces by Ruen Brothers – so new it’s not even out yet. A bit reminiscent of the much missed Roy Orbison, but very rocky and punchy. Hugely catchy. One swear word. Heat the oil in a large saucepan over a low flame. Add the leeks or onions and sauté gently for about five minutes, stirring occasionally. Add in the garlic and celery, sautéing for a further two minutes. Pour on the hot stock, bring to the boil and simmer for 15 minutes. After 15 minutes add the broccoli, bring back up to the boil then simmer for a further five minutes. While the vegetables are cooking, pop the now-softened cashews with a couple of tablespoons of their soaking liquor into a food processor. Whiz the nuts until very smooth and just starting to gather. You will probably have to scrape down the side a couple of times. Don’t go too far with the blending or you will have cashew butter! If you are making the crispy wonton twists, take 4-6 wonton wrappers and cut them into strips. Spread over a small amount of sun-dried tomato puree or tapenade and carefully pick up each strip and twist before placing onto a baking sheet. Bake the strips at 180C/250F for about 5-6 minutes, or until golden and crisp. You can also just brush one side with a little olive oil instead of the tomato paste. For the phyllo version, cut a section of the phyllo sheet into 5 cm long strips and proceed as above. You can carry on and use up the sheet – and indeed more wonton wrappers – and store for a few days in an air-tight container. When you are ready to eat the soup add the creamed cashew and the basil leaves to the pan and blend with an immersion/hand blender until smooth. Taste for seasoning; you might want some pepper or lemon. Ladle into serving bowls and top with the wonton twists. Serves 4. Easily doubled. Tastes and looks best fresh, but will freeze okay in a pinch. 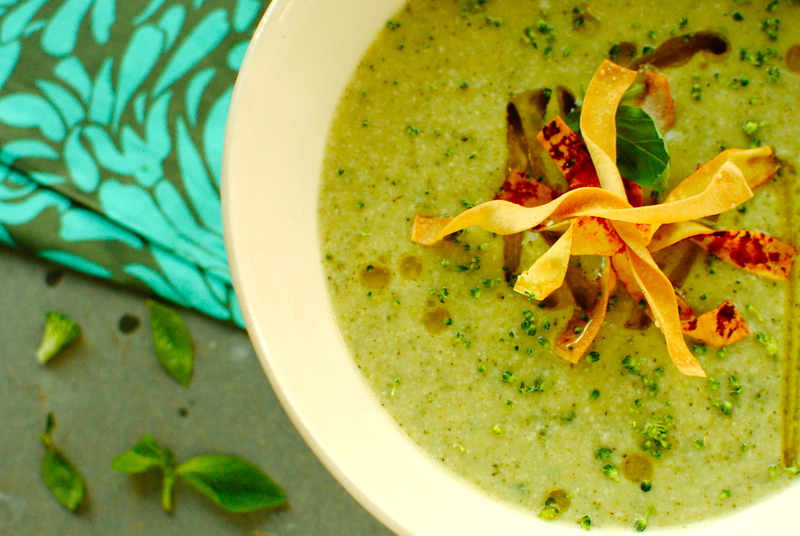 It is an old vegan trick, making soups very creamy but without the sat fat and dairy. Although I have dairy I like to use alternatives when the result is as good – if not better – than with dairy. If you try this I would really like to hear what you think. I wouldn’t steer you wrong Jackie! Wow, awesome, I am so excited to try this! This sounds great. (And looks great in your photo!) I’m a new Vegan and other people’s blogs have been a great source of inspiration and encouragement. Thanks for sharing this. I’m finding it’s definitely not boring! 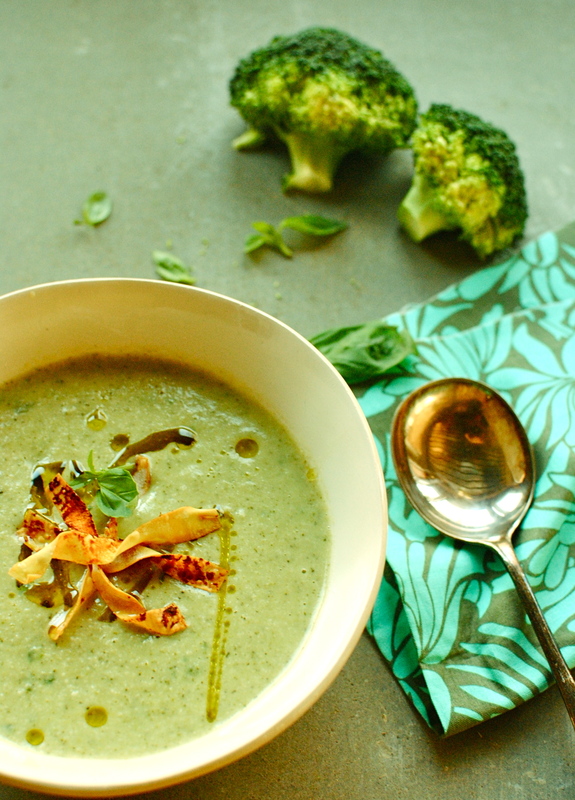 As a lover of soups and a fairly recent vegan (at least, in terms of my diet), this recipe sounds absolutely stunning! My poor blender’s been getting a workout this week, but if it’s for the sake of delicious soups, then I think it’s okay. I also love the fact that you’re from Edinburgh! I visited there for a few days in autumn of last year while I was studying abroad, and really fell in love with the city and the surrounding area. Good to hear that the weather’s been so nice there recently! I love Edinburgh, but I have never felt compelled to eat soups until I moved here from Florida! I have learned a lot of tips from Scots. They are great soup makers and bakers. That is a lovely soup and I, for one, NEVER tire of soup. Not even on an 80+ (F) day! Soup is a favorite dinner option at my house. Can be prepped ahead and always a great way to empty the veggie crisper of odds and ends. 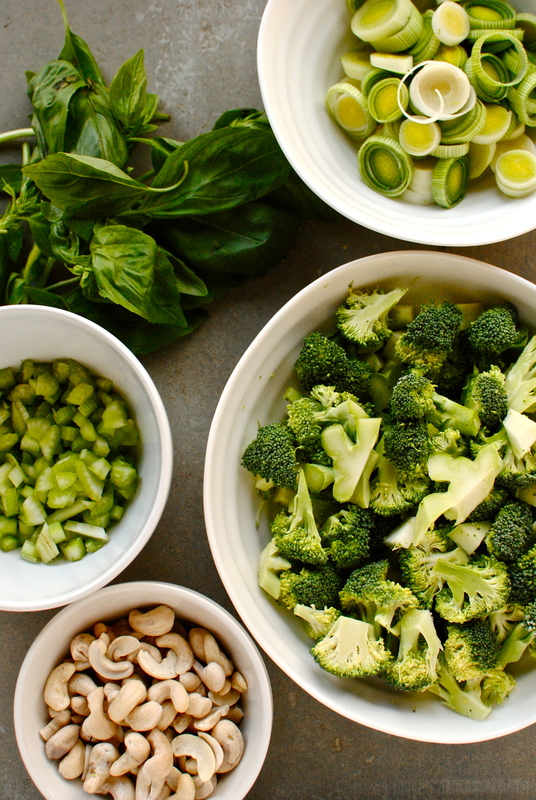 Broccoli and basil are a wondrous pairing of flavors! 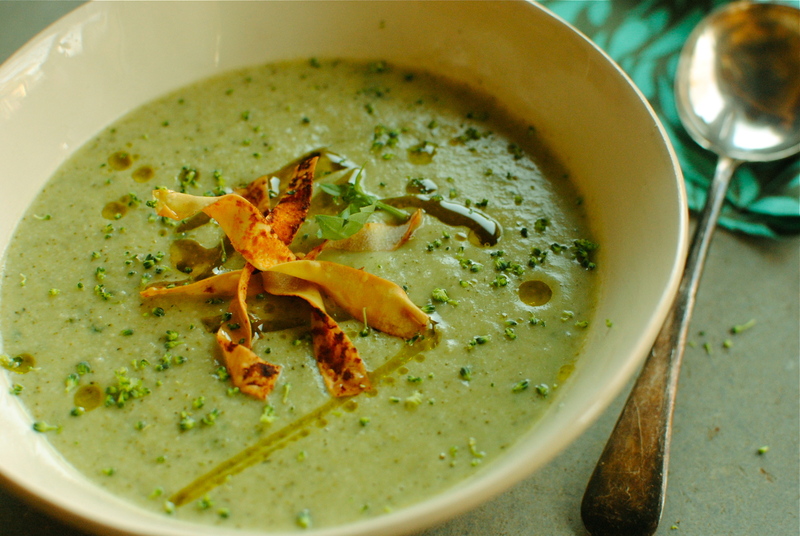 Adore the verdant green of the soup, just divine! 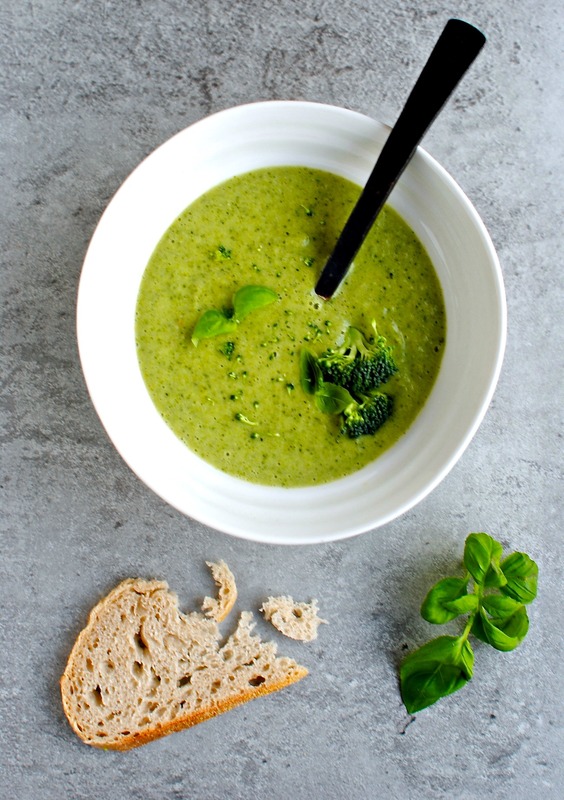 Soup is a great repository for odds and ends in the fridge, but sometimes it is nice to come up with something specifically, like this broccoli and basil soup. I just really fancied seeing what that would taste like with the cashews, and luckily – at least this time – it was as good as I expected. I bet most of your experiments are even more successful. If you hadn’t been so busy this week you could have had this at my house first: try before you buy, sort of. Kellie another beautiful recipe. I love how fresh produce is the star in your recipes! Beautiful clicks and awesome recipe! Can’t wait to try! Thanks for the kind compliment, and for stopping by. I love your name! Oh, I know what you mean Kellie – I’m not quite ready to say goodbye to soups just yet and I’m in warmer climes! What a wonderful creation you have there. I’ve never used cashews in soups before – only really in sauces. Do you think almonds could work just as well? Oh gosh Jacqueline, you are incredibly kind. I wish you were a lot closer; we could get into all kinds of tasty mischief in Glasgow or Edinburgh methinks. I hope the next time you are up our way you will give me a dm and we can meet up (crossed fingers). Oh yeah, your question: of course almonds be be fabby but they would defo need soaking as they are inherently harder than the liquid guzzling cashews. The lushes! I can’t remember seeing nut soup but I do remember the stuff they put booze in! And the crazy hot lemon curd. I’m glad you like the sound of this but a Vitamix *sigh* would make it even better. Still, the soaking really does make the cashews very smooth. Thanks Shuhan 😀 I also make them as little cups (push in a mini muffin tin) to hold little appetiser bits for weddings, etc. Very cute and so very easy. Much nicer than a vol au vent! Second bowl of the soup, I am pleased about that Jackie. I’m glad you trusted me on this! I am so glad to be reading about this vegan trick right now! My boys (husband and son) recently figured out they have a dairy allergy so I have been experimenting with substitutes. Unfortunately it is also a wheat and egg allergy. I feel like using nuts as a cream base is going to be great for many things other than just soup. How cool that you dream in recipes? I could get into that. I don’t think I do that – I dream of cooking often, but not quite formulating full recipes. I am going to journal about recipes before bed and try to work that into my sleep pattern so I can whip up these delicious meals! Ive had a pack of phyllo dough in my fridge for awhile now- great call with using them as crisps. A lovely healthy recipe, Kellie, and what a great idea to make twists from wonton wrappers. This looks delicious! And so easy to make! Cashews and coconut milk make creamy soups “legal” for those of us who can’t eat dairy. I’ll have to try this recipe! 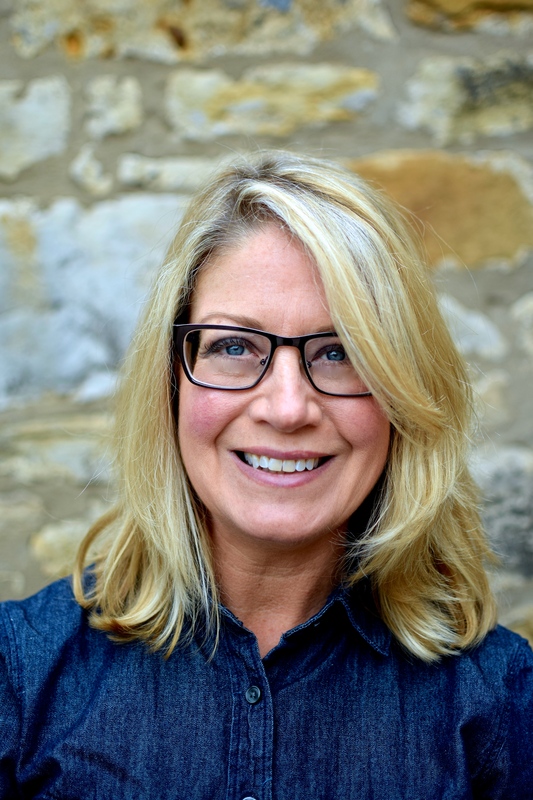 Thanks, Kellie, very nice blog!